Sugar and her sister, Chaunty, came into our lives before we realized we wanted to be full-time farmers. Originally we were looking for pygoras and adopted Sugar believing that she was a pygora. Well, as it turns out, she is actually a pygora-cross, but we love her anyway! Sugar and her sister live separately from the rest of the herd because they can be a bit too pushy and I like to keep my herds calm and manageable. 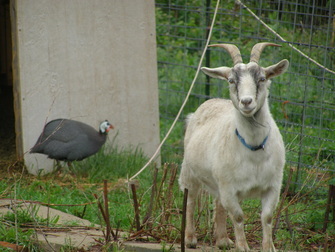 Sugar and Chaunty love each other dearly and are so very closely bonded that they don't tolerate other goats well. They do love my hubby and me, though. They are very well-behaved and friendly towards us. Sugar grows a nice, fine, cashmere fleece that I have enjoyed spinning into incredibly soft yarn, but her coat possesses much more guard hair than a purebred pygora, so the amount of quality, salvageable cashmere fiber is much less than a purebred pygora of similar size and fleece type. Over the years, these two girls have taught my hubby and I so very much and we are grateful for the invaluable contributions that they have made in our farming adventure! Chaunty possesses a quiet, independent, yet well-behaved nature. I find her company to be relaxing and comforting, but she doesn't have any interest in other people or goats besides myself, my hubby, and her sister Sugar. Chaunty is also not a purebred pygora. Technically she is a specific type of pygora-cross called a pycazz. 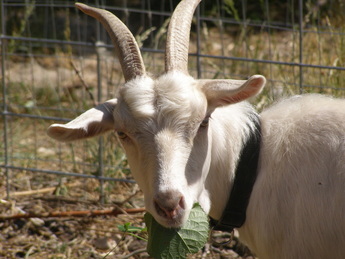 A pycazz goat occurs when a full-sized cashmere goat is crossed with a pygora or pygora-cross. This cross-breeding is intended to produce progeny with an even finer cashmere fleece while retaining the positive attributes of the pygora breed. Overall, Chaunty is a perfect specimen of this cross-breeding. She produces a cashmere fleece with an incredible 12 micron! Although that is hard to explain exactly how fine that is, suffice it to say, that each individual strand is so fine that they can not be distinguished individually. Like her sister, though, Chaunty also produces a significant amount of guard hair, so the actual amount of this breathtaking cashmere is very limited. We choose not to breed either Sugar or Chaunty because, as we have learned more and hopefully are now better farmers, we feel that both Sugar and Chaunty are not breeding-quality. They both possess too many flaws (such as excessive amounts of guard hair) to encourage their genetics in future generations. Sugar and Chaunty will live out their lives as well-loved pets on our little farm, receiving special attention every day and separate living accommodations.